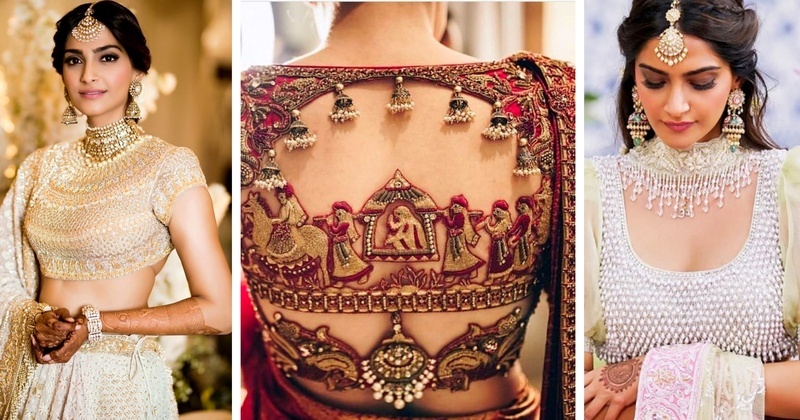 30 Latest lehenga blouse designs for the modern bride! After you’ve picked your dream lehenga, the next step is to choose which lehenga blouse design will you sport along with it? Will you be a modern bride who sports an off-shoulder bridal blouse design or a backless choli or will you opt for ¾th sleeves or a high neck blouse? The sheer intricacy of this lehenga blouse design made me spellbound in the first glance itself and hence finds its place first on the list! If you’re a bride who wants delicate details on her back, then this is THE latest blouse design for back, which you should opt for. Just look how beautiful it is - an entire doli scene has been carved out in the fabric and its beyond gorgeous! Unicorn has been in trend for quite some time now and if you are a fan of it too, then you’ve got to own a unicorn inspired bridal blouse design like this one. Totally in love with this Manish Malhotra creation! This latest blouse design is perfect for a day function like the mehendi or sangeet. Sonam Kapoor made a lot of noise with her ivory and gold bridal blouse design which she wore for her mehendi. This Abu Jani and Sandeep Khosla lehenga blouse designs took over 18 months to come to life and was totally stunning! This one is a total killer! An off-shoulder bridal blouse design with a sweetheart neckline is a great option for you if you can pull it off! Apt for your reception and sangeet ceremonies! There is something seriously regal about these embellished lehenga blouses with a deep sweetheart bridal blouse designs! P.S. it also, brings out the bridal necklace very prominently! Kareena Kapoor grabbed a million eyeballs in this stunning off-shoulder yellow bridal lehenga blouse design with heavy embroidery and the pearl details on the sleeves! From the vintage one to this stunner here, this lehenga blouse design by Abu Jani Sandeep Khosla has been giving us some major #BridalGoals! If you have been regular on your diet then you should definitely flaunt it in this new bridal blouse design. This embellished bustier is definitely not for the faint hearted ones! It’s seriously hard to take our eyes off this bride’s ivory halter neck embellished bustier! How cool is her bridal blouse design? This bride had ‘Sarva ki Dulhaniya’ written on her blouse with an illustration of herself in the doli! How stunning is that? This personalised blouse is one of the latest blouse design for the back and being re-created by a lot of brides out there! The transparent puffed sleeves are again back in fashion in designer blouse patterns and we are loving it! Off-shoulder lehenga blouse designs have been trading for quite some time and by the looks of it, they are here to stay! This off-shoulder bridal blouse design is one such stunner and I’m in love with those puffy sleeves! Okay, you should know by now, we are not getting over Anushka Sharma’s blush pink and Ivory bridal blouse design which she wore for her private wedding in Tuscany. This Sabyasachi renaissance embroidery in vintage English colours embellished with silver-gold metal thread, pearls and beads will forever remain a classic. Full sleeved bridal blouse designs have a different charm to them and we can't get over how stunning they make the brides look. These lehenga blouse designs are gorgeous and elegant at the same time and make a great fashion statement. This classic deep U neck bridal blouse design is a stunner and will remain timeless for the years to come! These regular sweetheart bridal blouse designs are perfect when you wanna let your outfit do all the talking. I am in love with how how simple yet royal this bridal blouse design is! If you are not in the mood of any of the traditional lehenga blouse designs then opt for a jacket instead! Stunning and fuss free at the same time, you let your hair down and dance your sangeet/mehendi function away! Minimalistic is the next big thing in fashion. It means popping the outfit with the design element rather than being OTT. If this style defines you, then these lehenga blouse designs should already be a part of your Pinterest board. You could go up or down with the sleeve length and this bridal blouse designs will look stunning either way. Think of a going all out with your lehenga and pair it with a bridal blouse design of this sort! If you are a fan of deep necks, here’s a design that is exciting. Simple, stylish and sensuous, these lehenga blouse designs basically tick off all the boxes for a great looking blouse! Include the tassels for that oomph factor! Love this crisscross bridal blouse design! You’ll definitely be a head turner sporting this stunner! Stunning, sensual and elegant at the same time, these round latest blouse design for back are our all time favourite. Don’t plan on baring it all? This latest blouse design for back with intricate embroidery on it with hooks behind is a stunner. This crop top paired with jacket is a gorgeous lehenga blouse design option for the brides who wanna do away with their bridal dupattas. How ah-mazing is this deep-square neck bridal blouse design? I say it’s a great option if you wanna do away with all those sweetheart and deep U’s! If a traditional lehenga choli is just not your style then glam your bridal outfit by pairing it with a peplum lehenga blouse! Refreshing right? I know it’s a bridesmaid outfit, but this totally works as a sangeet or cocktail bridal blouse design, don’t you think? Everyone is going gaga over a sweetheart front bridal blouse designs, but how gorgeous is this stunner. This new blouse design is already making its way into a lot of bride’s trousseau. How about giving your regular round back a twist? This deep square cut bridal blouse design with latkans is a feast for the eyes. How stunning is this yellow blouse with minimal embroidery? I say, it’s a great choice for mehendi or haldi functions. Last on the list, this ‘Cant Keep Calm’ lehenga blouse design is a statement maker! So, did you find your favourite bridal blouse design yet?